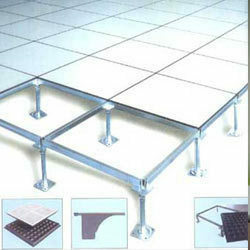 We are well specialize in false flooring system at our clients premises. We provide & fix false flooring in computer room, offices, main halls, electrical DB room & server room etc. These false flooring are certain to get a new, attractive, durable and long lasting looks to their office, home or a particular room. Our flooring experts use quality inspected flooring materials to ensure satisfaction and safety to our clients requirement. Excellent grounding and electrical continuity. Easy and fast approach to concealed wires, cables, boxes etc. Fast installation and easy to service and use. We have been into this business for around a decade now under the name of MEENA FOAM N FURNISHING a proprietor firm formed in 1986. Realizing the changes in need of new millennium MEENA DCOR was formed in 2003 as PVT. LTD. Firm. One of the reasons for its unprecedented success is that it incorporates both the initial business ethics and latest technology, and the blend of the two has always spelled perfection. At Meena Dcor Pvt. Ltd. We put our esteemed clients first and specialization in customizing completely as per the client need, flexibility and customization is the key word in the organization. Today Meena Dcor Pvt. Ltd. is a big family of smiling clients.